On April 9, 1940 the German army crossed the Danish border by land, sea and air during Operation Weserübung. The plan was to overrun Denmark as swiftly as possible. The campaign lasted approximately 6 hours and was indeed the briefest operation of the World War II. As Denmark capitulated quickly, its occupation was uniquely lenient. Both King Christian X and Danish government remained in the country until the government was finally dissolved by German authorities. The mortality rate during the occupation was very low. By the end of the war, an effective resistance movement developed in Denmark. In 1943, the Danish resistance movement managed to evacuate almost all Denmark's Jews to Sweden. The occupation ended on May 5, 1945 when the German forces withdrew following their surrender to the Allies. 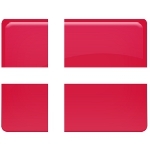 As it has already been said, on April 9 every year the state flags of Denmark on flagpoles are flown at half mast until noon to symbolize the mourning. At 12:00 the flags go to full to indicate that Denmark is free country now.